My good friend, Jay, is still recuperating from back surgery. He is very patriotic and is always sending emails about our troops and American holidays out to his friends. I made this card to send him for Memorial Day. 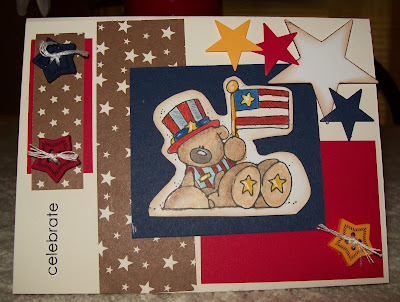 The image is Patriotic Bear from Whipper Snapper Designs. The layout is from Michelle O's blog Stamps, Paper, Scissors and Donkey Smiles. The star papers are from a stash of dp Mat Pack. The sentiment is a Stampin' Up rub-on. The star buttons have been in my button inventory for a long, long time. I used embroidery thread on the hole (and boy what a hard time I had doing that. As a result of diabetes, my left hand trembles and it was a real chore threading the buttons -- note to myself .. invest in another needle threader)! This is ADORABLE!!! It's so rich and warm and I really like all the layering!!! !